A few of the biggest names in music history have just formed their own Super Group by joining their forces together. Rage Against The Machine, Cypress Hill and Public Enemy have united and formed ‘Prophets of Rage‘, a new super group that packs a punch to put down a herd of elephants. Both political and musical, all three bands have been known for their great, loud, in-your-face music intertwined with today’s politics. The super band has quite good timing too since we do have a Presidential Election coming up soon. Part of the reasons for the formation of the group, was to spread their political views (and their music). Look below for the latest list of Prophets of Rage tour dates, links to look for tickets, and some cool pics and videos. 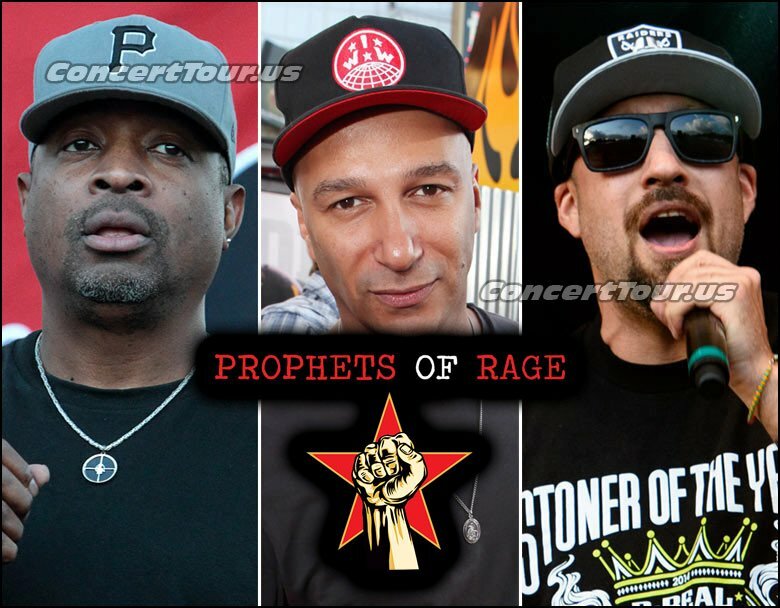 Prophets of Rage – Supergroup Formed by members of Rage Against The Machine, Public Enemy and Cypress Hill. Check back often to see if Prophets of Rage adds any additional tour dates. Don’t Miss Your Chance To See Prophets of Rage perform at a venue near you!